The Indians yesterday celebrated the festival of colours Holi with pomp. The festival of colours is celebrated as a triumph of good over evil. 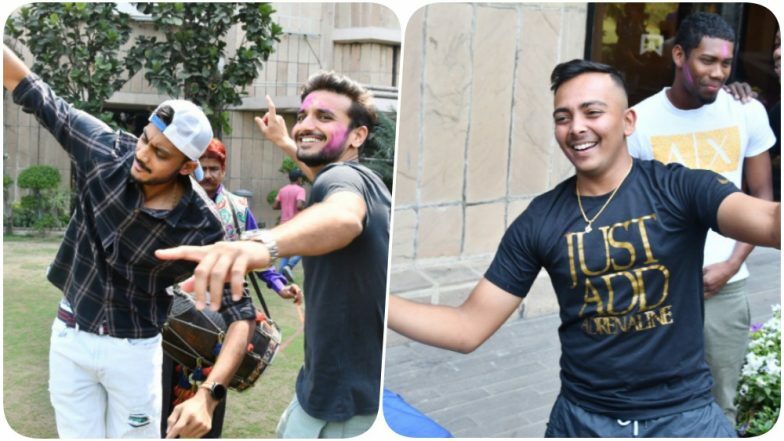 Even team Delhi Daredevils joined the bandwagon and celebrated the festival with utmost joy. Prithvi Shaw, Axar Patel, Harshal Patel, Sherfane Rutherford, Keemo Paul and a few other members of the team were seen letting their hair down ahead of their first game against Mumbai Indians in the IPL 2019. Shikhar Dhawan Shares a Picture With Sourav Ganguly During Delhi Capitals’ Training Session Ahead of IPL 2019; Yuvraj Singh Trolls Gabbar. The members of the team were seen applying colours to each other. Later Prithvi Shaw, Axar Patel, Harshal Patel and others were seen grooving to the beats of dhol. Needless to say that the players had a great time celebrating the festival. The pictures and the video of the same were shared on the social media pages of the Delhi Capitals. IPL 2019 Schedule in PDF: Download VIVO Indian Premier League 12 Full Timetable With Fixtures, Matches, Team and Venue Details. Axar Patel and Harshal Patel dancing to the beats of dhol. Prithvi Shaw also joins the bandwagon. Looks like the players are having a gala time. Sherfane Rutherford also joins the celebrations. Talking about Delhi Capitals, the team will play their opening game in Mumbai against the Mumbai Indians on March 24, 2019. The teams will be led by Shreyas Iyer and will look forward to winning their maiden title this year. It was last year during IPL 2018 that team had named Shreyas Iyer as the skipper of the team in the middle of the season.